Caption : KHAMMAM_(ANDHRA PRADESH)_Anxious wait: Minister for Cooperation and Labour and Employment R. Venkat Reddy addressing the crowd who were waiting for the Kadapa MP Y.S. 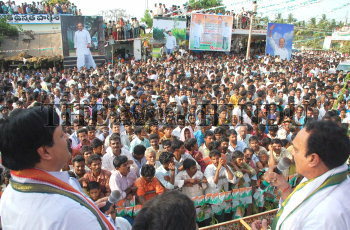 Jaganmohan Reddy at Gangaram Village in Khammam District. MLC P.Sudhakar Reddy is also seen. Photo: G.N. Rao (12-04-2010) .